Main Street in Paterson, New Jersey, south of the interstate has already been documented as a Middle Eastern paradise on this website and many others. 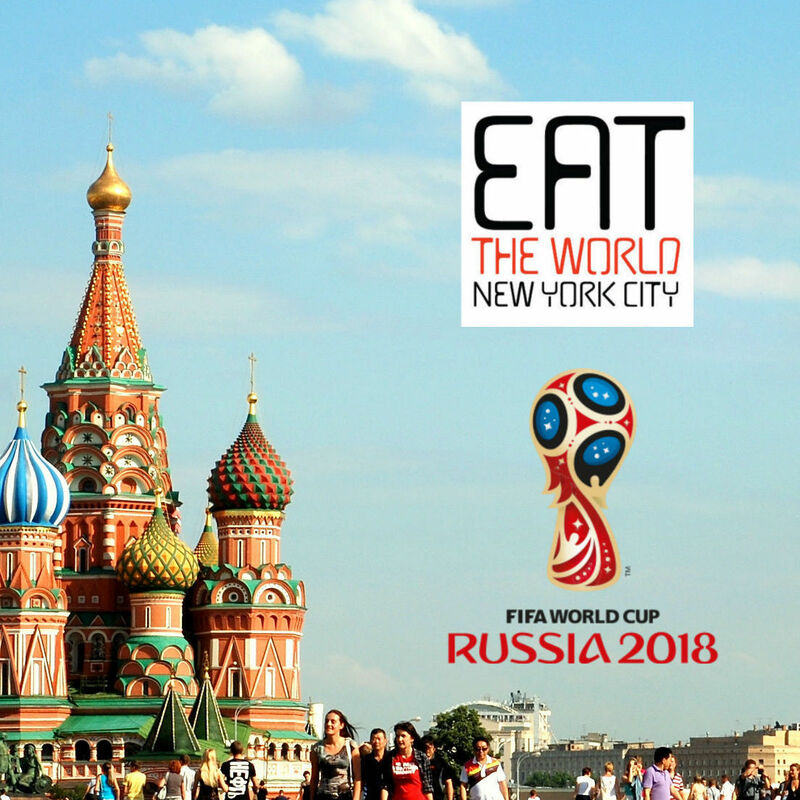 When I spend the day in New Jersey, I often gravitate here and stand in wonder of all the restaurants I need to try. 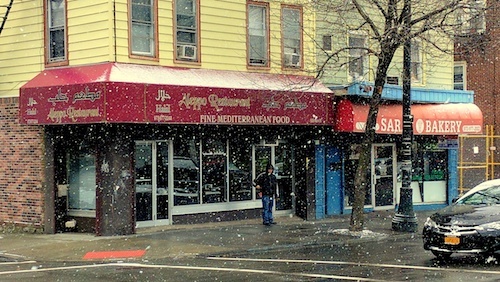 Aleppo has always been near the top of this list, and finally a proper lunch was eaten on a recent snowy day. Inside, the vibe is relaxing and Middle Eastern hospitality is always on another level. Pistachio walls with dark wood wainscoting is the main decor, while one plant creates vines for an entire wall. News on the television shares time with Arabic music videos. The small child of one of the women working here runs around happily, smiling at customers. 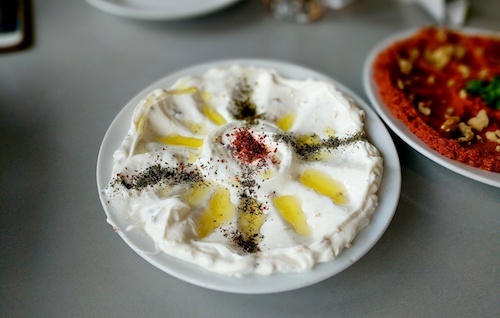 While the list of appetizers (meze) is quite large, the rest of the menu is not gigantic, so they have their specialties. 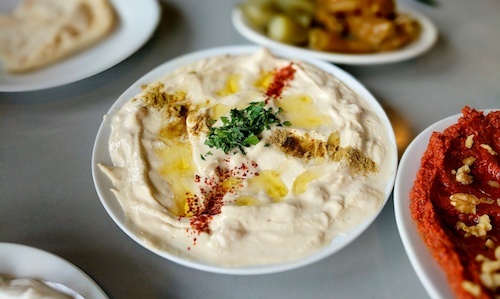 We selected a few of the meze, starting with musabaha ($6, below), a type of hummus that also incorporates whole chickpeas. Here they also sprinkle on some dried Aleppo peppers, which add a noticeable kick. Like every hummus in Paterson, this is of excellent quality and very recommended. 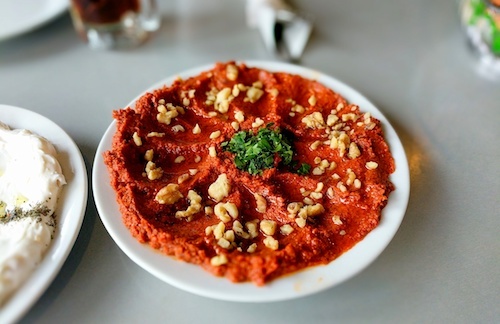 After recently falling in love with the muhammara ($5, below), at Al-Basha down the street, an order of this dish that calls Aleppo its home was essential. Fresh Aleppo peppers are ground up and combined with walnuts and olive oil. If your meze samplers are getting too similar from meal to meal, try spicing it up with a plate of this next time. A little too sour for our palates, an order of the labaneh extra ($7, below) also made its way to the table. The "extra" in this case is walnuts and garlic added to the yogurt. To combat the sourness, mixing with the muhammara and rice seemed to do the trick. 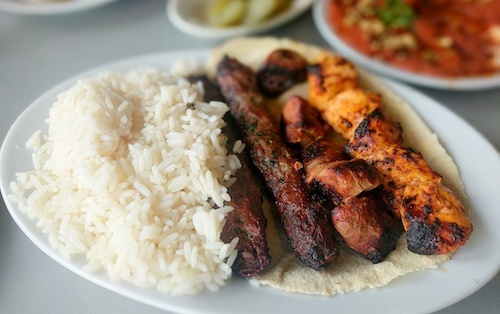 Not wanting to select just one meat, an order of the Aleppo mixed grill ($15, below) with rice was necessary. Of the four kebabs, the favorite was the chicken, a very juicy and well seasoned piece. The two kufta kebabs were also nice, and I always love eating these with some of the meze. The beef shish kebab dried out a bit too much and the seasoning did not make it past the skin. For only $1, don't miss the enjoyable tea they make here. $1 also gets a cup of very strong Arabic coffee. Watch out for early closing times if the restaurant does not have many customers. On a previous attempt, the shutters were down about an hour before their listed closing time of 9:30pm. On the weekday lunch visit, the restaurant was mainly empty, but they do have room to take on large groups. One table is set for 12 people.